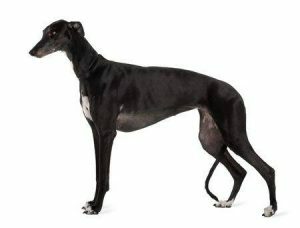 “Kebo” is a 5 1/2-year-old male, castrated greyhound that presented to SCAN for acute onset of inability to walk. He was initially presented to a local veterinary emergency center at 2 a.m., with reported signs of twitching and was non-ambulatory at this time. A CBC and Serum biochemistry panel were performed and found to be unremarkable. He was referred to SCAN later that morning for further evaluation. Kebo was rescued three years earlier and has an otherwise unremarkable medical history. Upon presentation, Kebo had a normal physical examination. His neurological exam findings included a dull mentation with a left-sided head tilt and head turn (torticollis) when positioned sternal. He was non-ambulatory and had hypertonicity in all limbs. Hypermetric movements/gait was noted in the right thoracic limb when weight was supported. Decreased physiological nystagmus (“doll’s eye reflex”) was noted bilaterally, and proprioceptive testing was mildly delayed in all limbs. The remainder of the neurological exam was normal. Based on the findings, a right-sided cerebellar lesion was suspected with signs of paradoxical vestibular disease and lateralized cerebellar ataxia. A brain MRI +/- CSF collection was recommended. A full contrast MRI study was performed of the brain including multiplanar T1, T2, T2*, FLAIR, and post-contrast T1-weighted sequences. The MRI revealed a sharply delineated T2 and FLAIR hyperintense region from the caudal cerebellar peduncle to the midline of the cerebellum on the right side (right cerebellar hemisphere) as shown in Figure 1. No apparent contrast enhancement or mass effect was noted. These MRI findings and distribution are consistent with an ischemic vascular accident to the right rostral cerebellar artery. A CSF collection was not performed due to the MRI findings. After full recovery from anesthesia, a Doppler blood pressure was performed and an average reading of 150mmHg was recorded. A total T4 was also submitted and noted to be within normal limits. Kebo went home the following day, after being hospitalized overnight with intravenous fluids and supportive care for nausea. He was able to stand with mild assistance the following day and would take a step with sling support. He was discharged with meclizine and Cerenia. Kebo returned for a two-week recheck, and had a completely normal neurological examination. His owners reported that he was walking well on his own within two to three days of returning home. Kent M, Glass EN, Haley AC, March P, Rozanski EA, Galban EM, Bertalan A, Platt SR. Ischemic stroke in Greyhounds: 21 cases (2007-2013). Journal of American Veterinary Medical Association. 2014; 2014: 113-117.